The UK is one of the most important places for curlews but numbers here are in decline. Throughout May across the RSPB we will be highlighting their plight. Many people are inspired by these birds - on Shetland two knitting patterns have been created in their honour. Curlews, more commonly known as Whaaps in Shetland, are part of the fabric of Shetland so we are thrilled that we have two knitting patterns to share with you for the RSPB #curlewcrisis month. 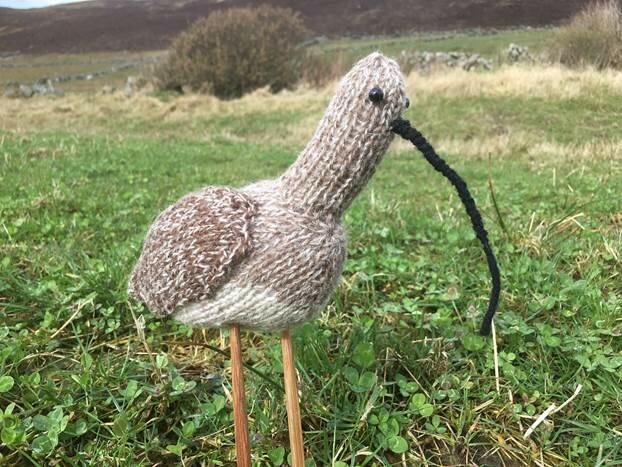 Linda Shearer, Chair of the Shetland Guild of Spinners, Knitters, Weavers and Dyers, has designed a knitting pattern for our Curlew Crisis month. You can download the knitting pattern from here. The model for the Whaap hat is Mrs Emily Henderson, daughter of Linda Shearer, who lives in Scalloway, Shetland. Linda was born and brought up in Shetland on the island of Whalsay and still lives there with her husband, four of her grown-up children and one granddaughter. She has been a member of the Guild since 2013 and the Chair for the last couple of years. She also tutors Fair Isle and Lace knitting through the island council’s adult learning programme and for Shetland’s Wool Week. Linda enjoys watching the Whaaps in the field next to her house. They have provided the inspiration for the knitting pattern. Traditionally, patterns were passed down generation to generation so it is only recently that they have started to be written down. 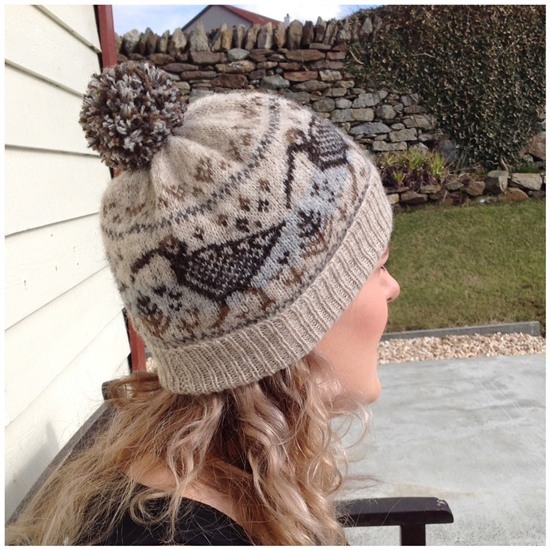 This is a generous hat knitted using Shetland wool. She reckons the pattern is intermediate level and it should take a couple of days to complete if you are an experienced knitter. The Shetland Guild of Spinners, Knitters, Weavers and Dyers was set up in Shetland in the 1980s. Its main purpose is to increase participation and interest in traditional crafts like spinning, knitting, weaving and dyeing. The Guild members spread knowledge of these crafts to the public through tuition, exhibitions and workshops and membership of the Guild is open to all. A key event is Shetland Wool Week which will take place this year from the 22 to 30 September. More information can be found here. Nicky Fijalkowska has designed a knitted curlew ‘Wendy the Whaap’ pattern. She is a knitting designer and hand-knitter based in Worthing, on the south coast of England. She has always loved birds, which was helped by being a member of the Young Ornithologists Club when she was a child. She still has all her Bird Life magazines! Her first book, Knitted Birds, was published by Search Press in 2015 and she is a regular contributor to Let's Knit magazine. The free pattern can be downloaded from here by using the code WHAAP, which is valid until the end of May. Here's a bit more on Whaaps from Helen Moncrieff, RSPB Scotland's Sheltand manager: "In winter, Whaaps can be seen along the voes feeding in the ebb as well as in fields. Places like the Pool of Virkie, a sandy tidal pool beside Sumburgh Airport, can attract dozens of feeding curlews and it’s lovely on a calm winter’s day to hear them calling and then watch them fly to their night-time roost on an off-shore island. As winter moves to Voar (spring) the air becomes alive with their calls. "They are a common sight and sound on ‘da hill’ (what many Shetlanders call moorland) and enclosed farmland, and no croft feels complete without a pair of curlews breeding there. One crofter said that Whaaps are his pest-controllers. He likes to provide breeding habitat for them on the hillground, knowing that they will come with their chicks to lower ground and eat the story-wirms (the Shetland name for leatherjackets cranefly larvae, an agricultural pest). "We are lucky that on Shetland that there are still many Whaaps remaining as they continue to inspire artists and crafters. We hope that you will download the patterns to knit either the hat or Wendy the Whaap and that you will share the pictures of your finished products with us on Twitter and Facebook using the #curlewcrisis hashtag. "It would be wonderful to knit a flock so we hope these knitting patterns will help everyone across the UK appreciate our beloved Whaaps even more." Donate to our Curlew Just Giving page. All the money will go directly to fund habitat management work, specifically designed to meet the needs of curlew.